Last updated: November 27, 2018 by Rootwell Products Inc.
Do you love fresh garden veggies? Do you also live in a cold climate? 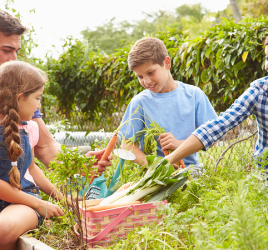 Have you found yourself wishing you could have fresh vegetables in your backyard through the winter months and not have to rely on expensive produce shipped from far away through the winter? Vegetable gardening can be relatively easy, inexpensive, and effective through the winter months. 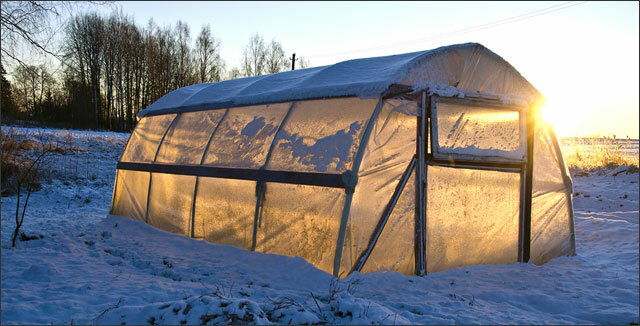 Additionally, you don’t have to use a heated greenhouse! One or two low-cost plastic greenhouses can supply you with all the heat these hardy plants require to thrive through the coldest part of the winter. You may not have tomatoes and strawberries, but you can get some of the most delicious salad greens and root vegetables right outside your back door. There are so many ways to have the benefits of a greenhouse without a huge expense. You can, of course, protect individual plants with cloches and small frame structures designed to be removable. However, you can also get a relatively inexpensive greenhouse kit that you can put up yourself in a weekend. Typically, these use UV stabilized commercial grade plastic that lasts six years over a high hoop structure and a base frame. These can be made with roll-up sides to allow ventilation in warmer months, and it’s easy to add your own door or a pre-made screen door for easy access. If you’re planning to use a cold greenhouse through the winter, most of the time it won’t be more than 20 degrees warmer than the outside temperature. But that’s often enough for these cold-hardy vegetables. Some sunny days may reach higher temperatures, and you can also use agricultural cloth over your beds that allow in light and holds in a bit of extra heat. Here is our list of top choices for winter vegetable gardening. Almost all plants in the onion family grow easily and well in a cold greenhouse over the winter. They typically have a long growing season and look after themselves, requiring almost no maintenance. 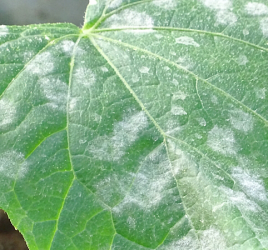 Since these plants are on a slightly different growing schedule, you need to plan accordingly. If you plant them in the autumn, they won’t be ready to harvest until next summer, so you’ll need to plant around them in the spring. Shallots are a delicious and gourmet addition to your aromatic mix. They bridge the gap between onions and garlic and can be used for either in a pinch! If you’re hoping for a zesty addition to your winter salads, there are varieties of spring onion that are winter hardy and do well in a cold greenhouse. Spring onions are a faster-growing crop and often can be used throughout the winter if planted at the right time in late summer. Look for the “White Lisbon” variety. There are so many varieties of winter hardy greens that can be harvested again and again. The savings you gain from not having to buy packages of organic salad greens (which inevitably go bad before you can eat them all!) is enough to pay for a greenhouse by itself. These winter salad greens are just a few of the possible cut-and-come-again salad greens that will thrive in a cold greenhouse through the winter! If you haven’t delved much into the Asian vegetable varieties, this is a good one to try! Pak Choi can be harvested for its leaves in salads through the winter. It can be allowed to mature for its stems, which can be steamed or used in stir-fries. This versatile vegetable is packed full of vitamins A and C, calcium, iron and folic acid. You may see it as a summer crop, but it can be sown in late summer under cover and thrive that way throughout the winter months. Many root veggies are not only cold hardy, but they depend upon a good hard frost to sweeten them up. Carrots, beets, parsnips, and turnips all fall in this category. In addition, these root vegetables are hard to find in the grocery store. Even when you can find them, grocery store varieties can’t rival the taste of home-grown root vegetables. Add them to your stews and winter salads or use them as a low-carb alternative to potatoes. 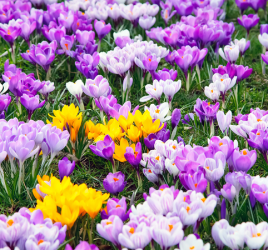 If you decide to spring for a greenhouse, not only will you be able to grow these crops through the winter, but you can start to harvest some of your spring vegetables much sooner than ever before. By sowing these in the fall, you can have them up to a whole month earlier than if you wait until spring. Beans and plant tips are both edible! Plan the “Aquadulce Claudia” variety for a quick-growing plant. Peas are another crop that will mature up to a month earlier than spring-sown varieties if planted in the autumn in your cold greenhouse. “Kelvedon Wonder” and “Meteor” varieties are exceptionally hardy. A good asparagus patch is an investment. If you don’t already have one, be prepared to wait. However, this tender, delicious plant is well worth the initial investment in time. These plants take several years to establish, but once they are producing, they will give you up to 25 spears per year and will continue to do so for 25 years. If you already have a permanent asparagus bed, consider using a small hoop house. If you have plenty of room in your greenhouse, consider planting your permanent bed there. You might have to wait a couple of years, however, you won’t be sorry. The great thing about one of these plastic greenhouses is their versatility. For cooler and more humid climates, greenhouses can work wonders for your Solanaceae crops: tomatoes, peppers, and eggplants. Tomatoes are notoriously finicky about how they get watered and prone to disease. Not only do they love the extra heat, you will be able to control the way they get watered and staked much more readily inside your greenhouse. Heat-loving plants will also benefit at the height of summer: okra, asparagus, and cardoon. An unheated greenhouse can be an inexpensive way to give yourself the gift of fresh greens and cold-hardy vegetables all winter long. However, the benefits don’t end there! Use your greenhouse all year long to improve the yields of all your favorite vegetables. It will pay for itself in a year, and you’ll never look back!